When listing your house for sale your top goal will be to get the home sold for the best price possible. There are many small projects that you can do to ensure this happens. 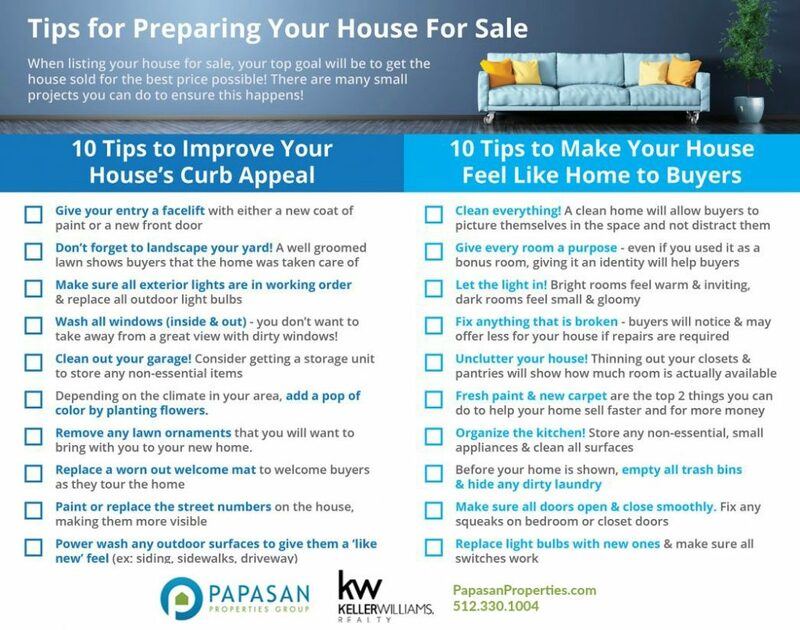 Your agent at PapasanProperties will have a list of specific suggestions for getting your house ready for market and is a great resource for finding local contractors who can help! © 2019 Austin Board of REALTORS® (alternatively, from ACTRIS). All information provided is deemed reliable but is not guaranteed and should be independently verified. The Austin Board of REALTORS®, ACTRIS and their affiliates provide the MLS and all content therein “AS IS” and without any warranty, express or implied.The information provided is for consumers' personal, non-commercial use and may not be used for any purpose other than to identify prospective properties consumers may be interested in purchasing. Data last updated: 2019-04-23T10:24:30.563.